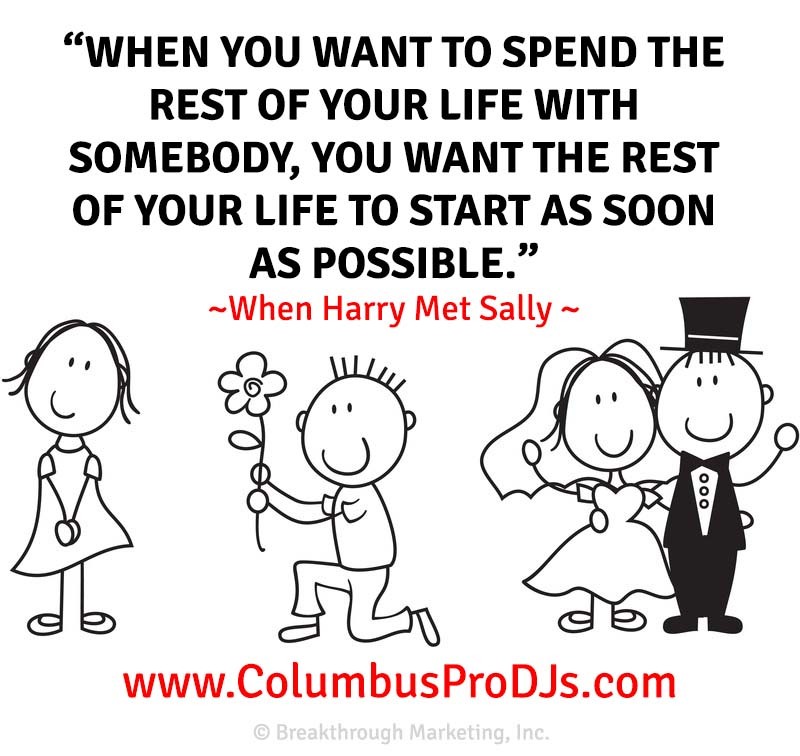 Two singular moments define your Columbus wedding day: your vows and your first dance. Here’s our top ten songs for your first dance. Your first dance is a magical moment in your life. You’ll never forget it. The song you select for us to play should be personal, meaningful, and nice and slow. Song lyrics are especially important in a first dance. Romance is the most popular theme. From our experience, a number of songs leap out as the most popular over the years. They are timeless. We can play them by the original artist, which is most popular, or by any artist who ever covered the song. Here’s our top ten songs for your first dance to get you started. Whatever you select, we’ll have it … or we’ll get it! A Thousand Years: What a huge hit from the movie, “Twilight: Breaking Dawn” in 2011. This song by Christina Perri has been viewed on YouTube a half a billion times. That’s billion with a ‘B’! Amazed: Most of the songs listed on this page have been field tested at weddings for half a century or more. Lonestar released this hit in 1999, and it’s a real winner for a first dance song. Can’t Take My Eyes Off of You: “You’re just too good to be true, can’t take my eyes off of you.” Even though this song was #2 on the Billboard charts way back in 1967, everyone knows those wonderful words. Perfect for a first dance! Even though this was a huge hit for Frank Valli and the Four Seasons, it has been covered by hundreds of major artists. Take your pick! We’ll play it for you! Can’t Help Falling in Love (with you): One word is all that is necessary: Elvis. Everything: Michael Bublé gets away from his usual big band treatment of songs with this totally catchy, guitar driven love song. Great melody. Fun, romantic lyrics. Looking for a lovely, happy song that you don’t want to end? Then “Everything” is for you. What a great way to launch your new life! Unforgettable: “Unforgettable, that’s what you are, Unforgettable, though near or far, Like a song of love that clings to me, How the thought of you does things to me, Never before has someone been more Unforgettable in every way.” The only thing more perfect than these lyrics for your first dance are the exquisite vocals of Natalie and Nat King Cole. This song is truly unforgettable on any list of top ten songs for your first dance. At Last: What passion! What romance! DJs all over the country tell me how often brides request this song for the first dance. The Etta James version from 1960 with its sweeping orchestration is the first choice of brides. But you can’t go wrong with Beyoncé’s cover either. The rich melody for this song was written by the ubiquitous Harry Warren, who also wrote “I Only Have Eyes for You,” mentioned elsewhere in this blogpost. The Way You Look Tonight: What an irresistible combination: Frank Sinatra and lyrics like these, written by Dorothy Fields: “Some day, when I’m awfully low, When the world is cold, I will feel a glow just thinking of you, And the way you look tonight.” Throw in Nelson Riddle’s swinging arrangement and you have yourself a first dance moment you will relive with sweet dreams on your fiftieth wedding anniversary. It’s that good of a song, and you’re that great of a couple. Want to slow it down a bit? Go with Michael Bublé’s version. Mellow. Lovely. Absolutely wonderful. Have fun with these top ten songs for your first dance. We’ll make your first dance as magical as you ever dreamed it would be with romantic lighting and the professional MCing the sets the stage … for you. © 2019 Columbus Pro DJs.